Acute ischemic stroke is the physiologic manifestation of lack of perfusion to the brain. This lack of blood flow may be secondary to thrombosis of a large vessel, an embolus from elsewhere that lodges into a smaller vessel, or systemic hypoperfusion causing ischemia of a watershed area with no collateral vascularization. We know that lack of blood flow leads to compromised vascular nutrients and oxygen supply, leading to loss of neuronal function, which manifests in a spectrum of functional losses ranging from weakness in the lower extremities to language and speech changes. Therapeutic strategies for acute ischemic stroke are focused on the restoration of cerebral blood flow and the reduction of the harmful effects of ischemia or tissue hypoxia on neurons. Fig. 1. Mechanism of action of recombinant tissue plasminogen activator (rtPA) and clinical risk factors associated with exclusion from thrombolysis therapy. In the last two decades extensive research and therapeutic advances have focused on carotid endarterectomy, thrombolytics, anticoagulant therapy, antiplatelet agents and neuroprotective agents as means of lessening the functional effects of acute ischemic stroke. Clinical findings resulted in FDA-approved serine protease tissue-type plasminogen activator (rtPA; Fig. 1). However, in clinical practice, the utility of rtPA appears to be restricted by a short therapeutic window from onset of stroke symptoms. Moreover, several lines of evidence suggest that various clinical risk factors are associated with exclusion from rtPA, and that women are more likely to be excluded from rtPA when compared with men. Our goal was to evaluate the association of clinical risk factors and gender with rtPA administration. We used univariate and multivariate statistics to analyze clinical risk factors associated with the exclusion of female and male acute ischemic stroke patients from thrombolysis therapy. The univariate analysis revealed that, of patients who received rtPA, 49.4% were female and 50.6% were male. Of patients excluded from rtPA, 55.7% were female and 44.3% male. Our predictive model indicated that male acute ischemic stroke patients excluded from rtPA were more likely to present with a history of stroke in the last 3 months (P<0.05, OR =2.028), hypertension (P<0.05, OR=0.519), and higher NIH stroke scores (P<0.0001, OR= 0.893). Excluded female patients were more likely to present with a history of stroke in the last 3 months (P<0.05, OR=2.332), diabetes (P<0.05, OR=1.88), and higher NIH stroke score (P<0.05, OR=0.916). Fig. 2. 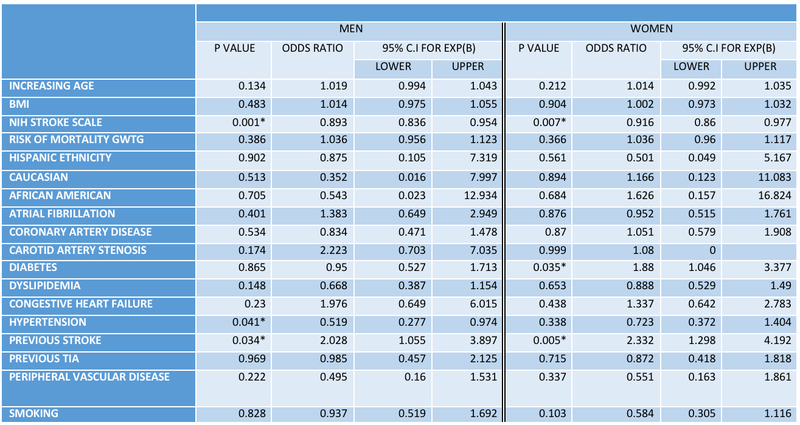 Association of clinical risk factors and gender with rtPA administration. Our analysis found similarities in the exclusion of males and females from thrombolysis therapy, both men and women who presented with history of stroke in the last 3 months as well as higher NIH stroke scale were associated with increased likelihood of exclusion from rtPA. We also found key differences in that male acute ischemic stroke patients excluded from rtPA were more likely to present with hypertension while females excluded from rtPA were more likely to have diabetes mellitus. Identification of modifiable clinical risk factors is important to improve the management of acute ischemic stroke patients. Our findings indicate that presentation within the therapeutic window alone is not a major contributor to intravenous rtPA administration, but that exclusion criterion is also meaningful. Increased clinician awareness of gender differences and clinical risk factors associated with exclusion from rtPA therapy could enhance the management of acute ischemic stroke patients and the rate of rtPA administration. Pharmacological thrombolysis for acute ischemic stroke treatment: Gender differences in clinical risk factors.